This is a reposting, a retelling, if you will, of last year’s Christmas Weed story because the most treasured traditions are those passed on year after year. Merry Christmas to all weed lovers out there! And so the story goes….The itty bitty weed flower stayed awake all night, and nigh about 3 am on Christmas morning, a jingling and a jangling she heard. There was snorting and rustling and the sound of reins being drawn tight, and quietly, ever so quietly, but loud enough for a weed to hear, Santa’s sleigh touched down just a few feet away from the weed’s spot on the frosty lawn. The sight was magic, with every detail rich. The red velvet of Santa’s suit and the fur that lined his hat were soft enough to feel without needing to be touched. The burnished gold details and the gleaming wood and the black iron runners on the sleigh were all so rich that they glowed as if lit from within. The reindeer were immensely powerful yet calm and gentle as they anticipated Santa’s every wish. As Santa stepped down off his sleigh, the ground beneath his feet turned into a field of snowflakes, so intricate and wonderous that the grass shimmered like a crown of diamonds. 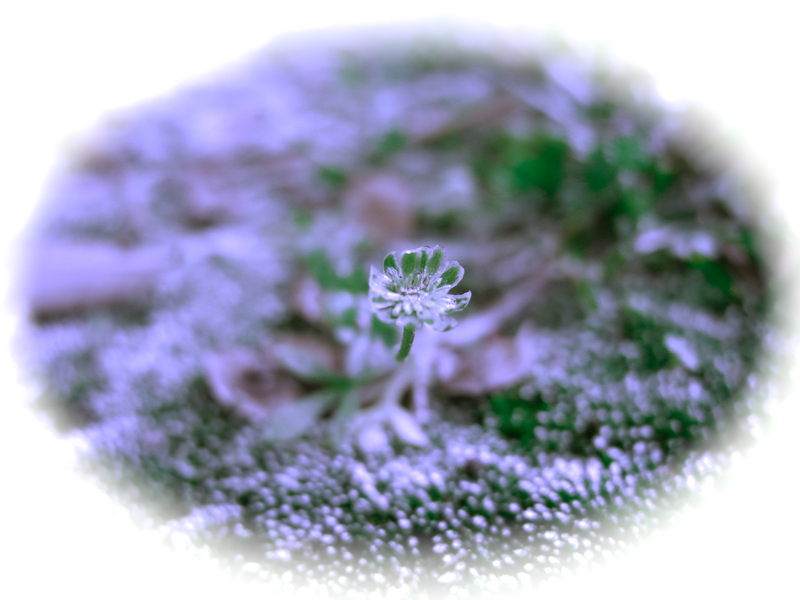 The little weed, ever so tiny, was the keeper of a very big wish. She had stayed up all night to see Santa, and now he was here before her, in the midst of his all important task. He gathered up his bag of toys and headed for the house, when suddenly he paused and slowly turned round. A jolly and sweet smile lit up his face as he looked down directly at the little weed. She knew with all certainty that she’d not moved at all, nor made any kind of sound, and she was every so tiny, how could he really see her? Santa bent down on one knee and reached his gloved hand out to her. With a loving spirit, Santa gently touched the weed flower and gave to her the gift to believe in all things possible. In that moment she saw that no matter how big or how small, no matter how important or not, our lives are wonderful, and our beliefs keep them so. In the morning as promised, I can out to see, and the tiny weed flower was still growing in the exact same spot, but now curiously enough, there was something beside her that had not been there before, a set of two parallel lines making grooves in the lawn. To my eye she looked the same as the day before, but when I searched my imagination for the magic, I saw she is changed today, and she has gotten her wish. She has become a living snowflake with the heart of a weed who believes. Merry Christmas everyone! I hope for you to see the wonder in your life today and everyday. This is so beautiful, thank you from all the weeds of the world. My pleasure! It’s the least I can do, considering all the joy that weeds bring to me.